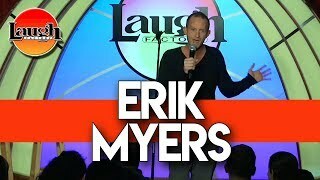 Erik Myers is a lovable lunatic who bombards the crowd with tales of bad dates and bad drunks at warp speed with his signature rapid-fire machine-gun delivery. He has over half a million views on YouTube and had his own one hour special “Dopeless Romantic” on Hulu. Erik can be seen on “The Blue Show” with Andrew Dice Clay on Showtime and has also been seen on Laughs on Fox, Comics Unleashed on CBS, The Latino Laugh Festival on SiTv and Gotham Comedy Live on AXS TV. His current album “Basket Case” is a favorite on Spotify, Pandora, iTunes and Iheartradio.